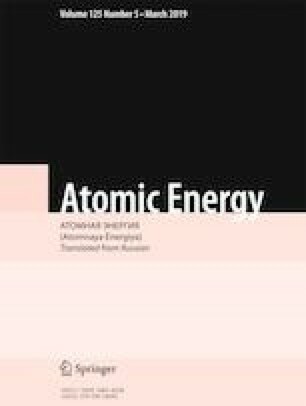 An analysis is presented of different methods of controlling the useful capacity of reactor units with hightemperature gas-cooled reactor and a gas-turbine system for converting energy on the basis of the Brayton cycle: by changing the pressure (mass) of the gas in the loop, the power of the reactor, and the temperature of the gas at the entry into the turbine by means of internal transfers of gas in the loop. The power dependences of the change in the basic parameters are obtained in the range from minimum to 100% in application to a reactor unit with thermal power 600 MW with a single-shaft turbomachine, which qualitatively, taking account of the lag of the processes in the reactor, can be extended to low-capacity units. Translated from Atomnaya Énergiya, Vol. 125, No. 5, pp. 266–271, November, 2018.